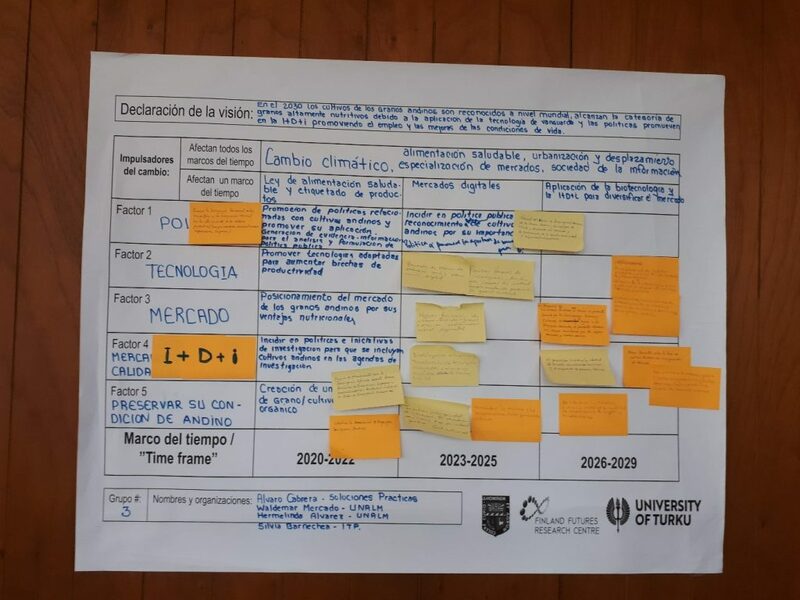 Yesterday we finished the last step of the four step futures process where we’ve focused on the development of innovation environments around the Andean native crops. Or more specifically, especially with Andean grains quinoa, kiwicha and kañiwa. During the past two years we’ve worked together with academia, public and private sector organizations and NGOs of the Peruvian and Colombian agro-food sectors. We started in 2017 with a horizon scanning, then developed scenarios until 2030 using tools and methods of futures studies. Once a common scenario for the desirable future of the Peruvian/Colombian agro-food sector had been developed, a road map with a shared vision was created. During this trip myself and the director of Finland Futures Research Centre (FFRC), Dr. Juha Kaskinen, have together with our local partners helped the sector stakeholders to define action plans on how to achieve the shared vision — what are the various practical steps to be taken, who are the responsible stakeholders, who are the beneficiaries, what are the resources needed etc. 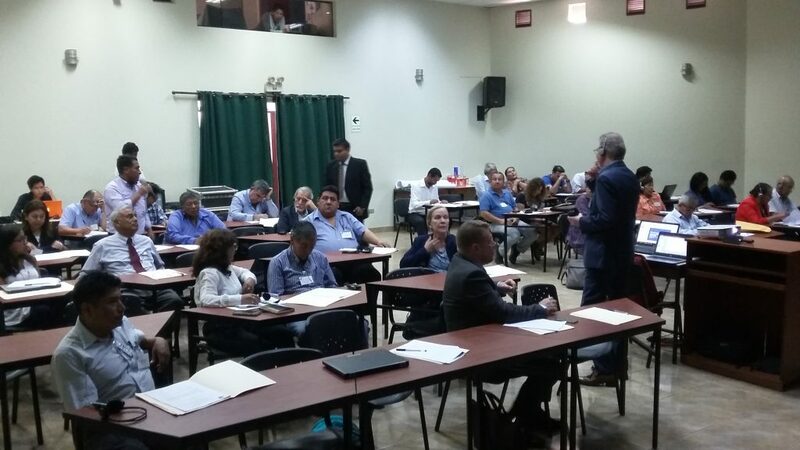 Stakeholders of Andean grains working in groups to develop action plans. Whereas our FFRC team has been the expert on innovation environments and futures processes, tools and methods, the local experts from companies, universities, ministries and NGOs are the experts of the Andean native crops. To me personally this has been an exciting and interesting experience as I’ve had the privilege work with the experts of the sector and learn about the Andean native crops and of the so called “super foods” (which by the way is just a marketing term), their nutritional properties, the development challenges and opportunities of the sector. It has been a mutual learning experience for us and I hope this is only a beginning for a long term process among the stakeholders and between FFRC and the stakeholders in the partner countries. In fact, many of the stakeholders have been interested to apply the tools and methods in their own provinces together with the provincial stakeholders. We are thus planning to share a guide with the stakeholders on how to take the process further in their provinces using the same tools and methods as we’ve covered during this futures process. 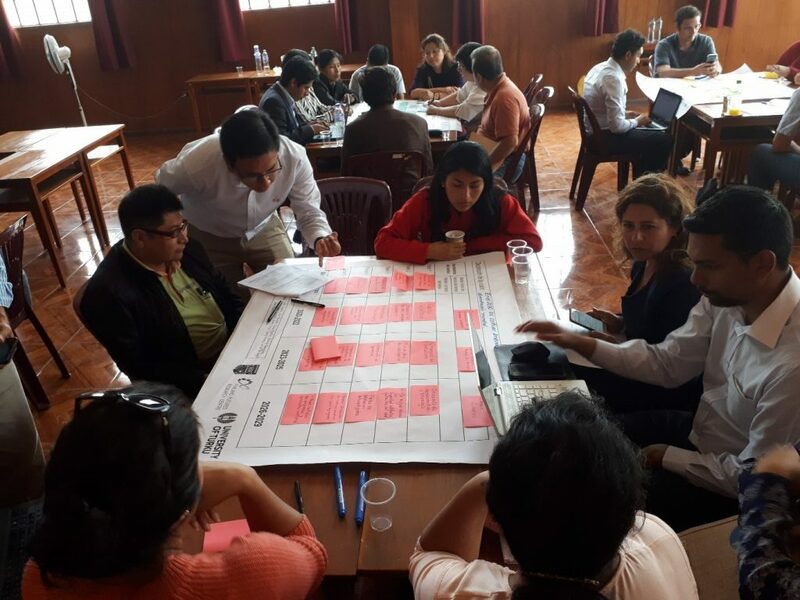 Around thirty representatives from ministries, companies, NGOs and academia participated in the workshop to develop action plans for the innovation environment around Andean grains in Peru over the next three years. The results of the last workshops are yet to be analyzed and published, but some of the key topics mentioned by the Peruvian expert groups were related eg. to the support and strengthening of the producer organizations, development of the value chains, commercialization, the use and improvement of certified seeds, development of innovation agendas, new products based on quinoa, and increased local consumption of Andean grains. The final results of the futures process will be published by October 2019. The first publication covering the two first steps of the futures process will be published in May in FFRC e-book series. According to the FAO (UN’s Food and Agricultural Organization) seeds are the alternative of the future to combat climate change and food insecurity. 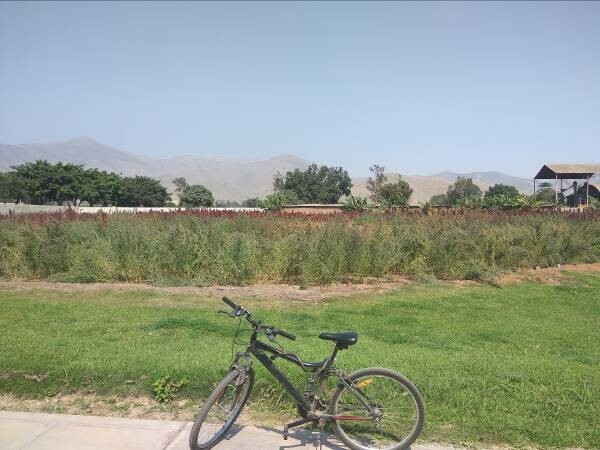 Victor Delgado Morales, PhD student candidate from the Peruvian partner university UNALM, has developed a research project focusing on gluten-free Lupine (Lupinus mutabilis Sweet) and chia (Salvia hispanica L.) cookies. He says that seeds are highly nutritious and have functional importance. Peruvian lupine, known in Peru as tarwi, is widely cultivated and consumed in the Andean high-altitude areas. Currently tarwi receives a lot of attention because of its high protein content, oil and fiber. Chia seeds in turn are widely distributed in Mexico and Central America and occupy an important market in countries such as Argentina and Bolivia, gaining interest in the field of food science and technology because of the high content of soluble and insoluble fiber and the presence of minerals such as magnesium, calcium, zinc and iron. Victor is a teacher at the Food Technology Department of the Faculty of Food Industries doing his doctoral thesis in the Food Sciences program of UNALM. 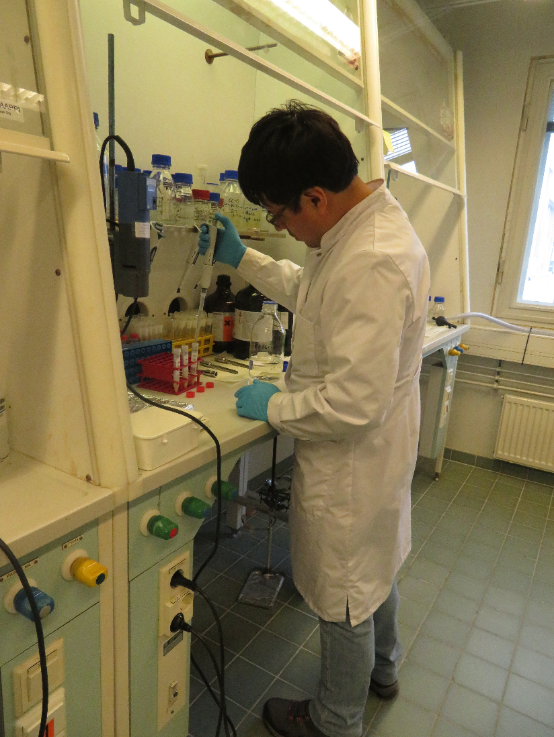 At the University of Turku, where he is currently doing an exchange period under the PECOLO project, he is developing his research with the support of Dr. Jukka-Pekka Suomela and other teachers and students of the Department of Biochemistry. Victor Delgado in the laboratory at the Dept. of Biochemistry of UTU. The objective of his research is to study the characteristics and physiochemical composition of white and black chia seeds which, in addition to the aforementioned properties, are quite important due to their high oil content with a good fatty acid profile. By using gas chromatography he has worked on the identification and quantification of fatty acids present in chia oil. After having made the chromatographic analysis he has managed to determine a fairly interesting fatty acid profile with the predominant fatty acid being linolenic acid, corresponding to a group of long-chain polyunsaturated fatty acids – better known as omega-3. This fatty acid is highly valued for its positive properties. In addition, Victor is determining the antioxidant capacity of chia seeds, which will allow a clearer understanding of the conditions to be taken into account when using the seeds in food products. Victor is one of the 4 PhD exchange students from Peru and Colombia who are doing an exchange period between 2-4,5 months at the University of Turku. 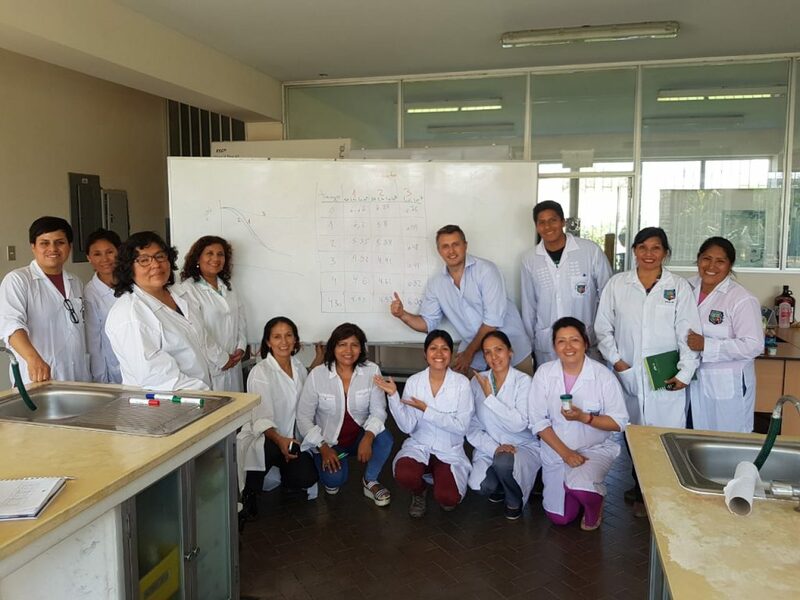 The exchange periods funded by PECOLO offers new perspectives to the Peruvian and Colombian students working one way or another with topics related to Andean crops, agriculture or food and nutrition. In addition, it allows Turku University to continue the long term cooperation with UNALM, as well as to identify future collaboration possibilities with Colombians. Last but not least, the project and the research of the students allows us at Turku University to learn more about Andean crops, agro-food sector and food and nutrition in Peruvian and Colombian context! The original blog post written by Victor is in the Spanish version of this page, here. Once again, our Finnish team travelled to Lima and Bogotá to run futures workshops with local partners. 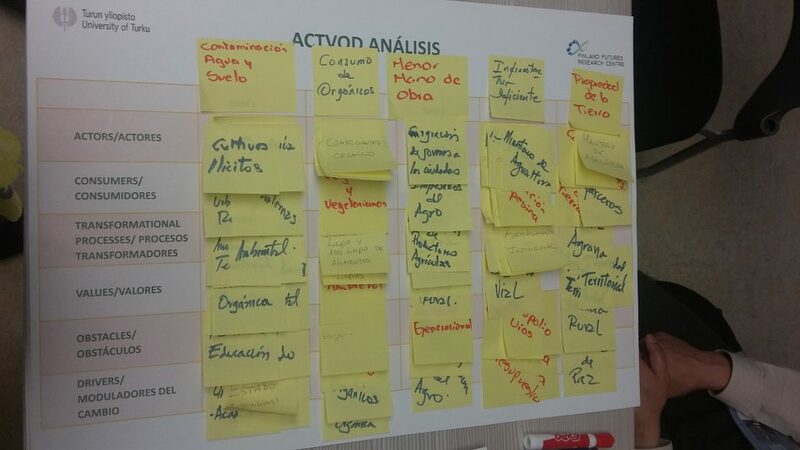 This time, we built together roadmaps for sustainable innovation environments of native Andean crops. 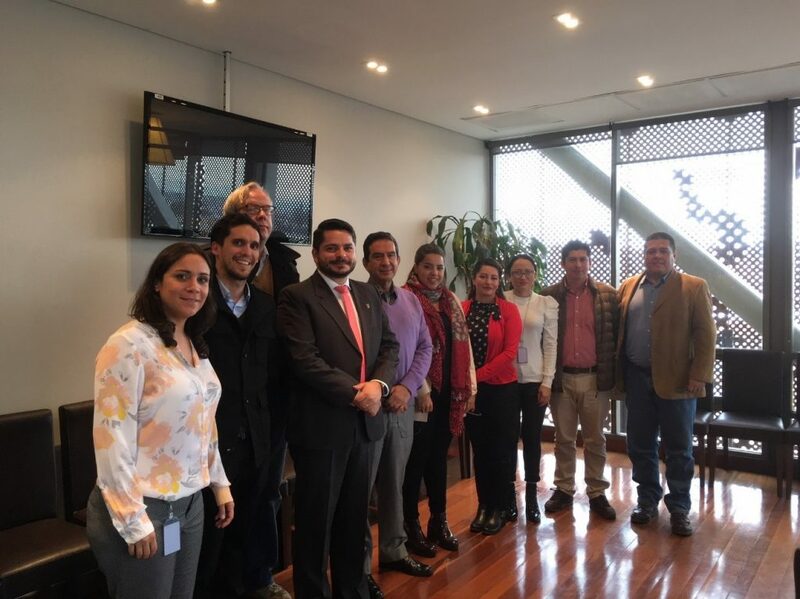 This was the third of four workshops, and the last one, to be held in April 2019, will focus on action plans for different stakeholders both in Peru and in Colombia. On May 2018 we wrote scenarios of desirable futures for the Peruvian and Colombian agrofood industry with a special focus on Andean crops. This time, we discussed what are the steps we need to take to reach that desirable future. Following the same model as the previous two workshops of this project, one of the days was dedicated to lectures on methodology, given by Dr. Juha Kaskinen, and the other day dedicated to interaction with local partners. The interaction with local partners started by introducing the project process, and giving an overview of what has been done thus far. Although most of our partners were the same from last May, many of them were participating in Futures Workshops for the very first time. We read the scenarios that were co-created with our partners, and with the help of images from Peruvian and Colombian landscapes, we started the workshop with a poetic immersion to their desirable 2030. Figure 1. 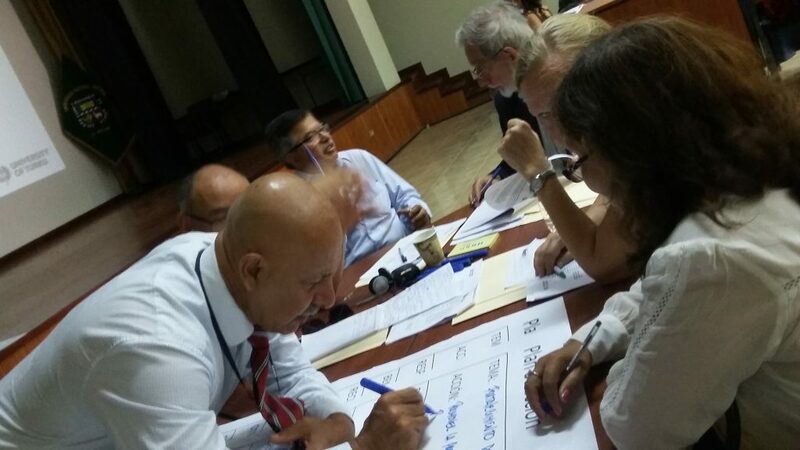 Group working on their roadmaps in Lima, Peru. Define what is the desirable future we want to achieve. Formulate a short vision statement. Identify drivers (e.g. megatrends, societal needs etc.) that effect and support your actions and deeds. Define the strategic steps/elements to take in each given time frame, so that they are possible and in relation to each other. Figure 2. Illustration of a result from the 3rd workshop of one of the groups. Below the vision statement, drivers of change are listed, such as climate change, search for healthy food, urbanization, etc. Note that some drivers of change affect the entire time frame, and some, affect only a small period of time. In the example above, the new law on food labels will affect mainly the first time frame, and by the time the second timeframe begins, it will already be institutionalized. Further on, strategic steps to take in each given time frame were formulated, and these steps to be taken end in 2029, because by 2030, the vision should be reached. Figure 3. 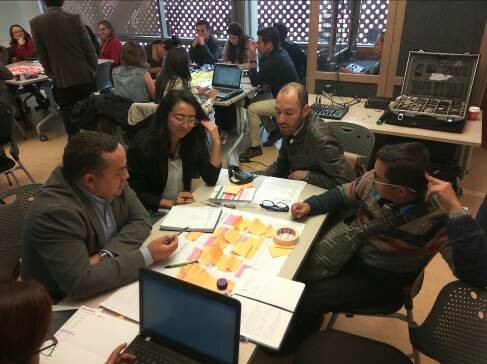 Group working on their roadmap in Bogotá, Colombia. 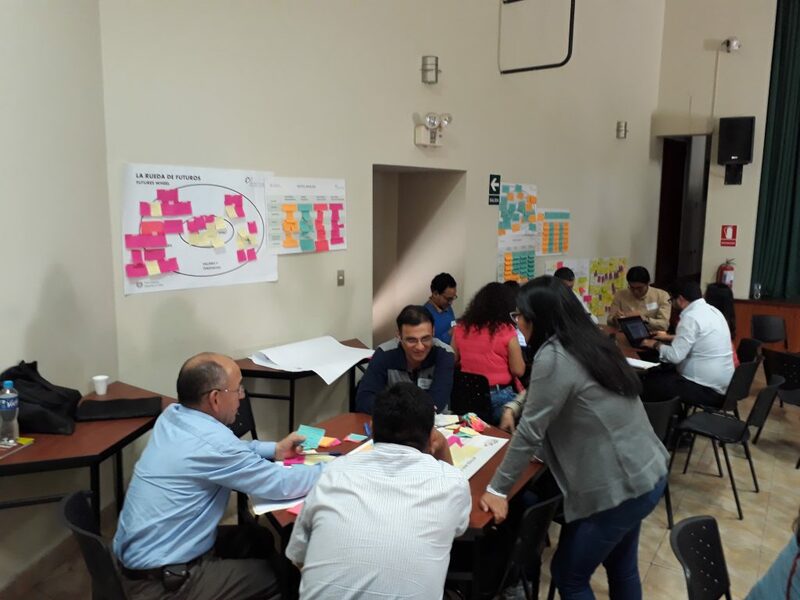 On our next workshop, in April 2019, we will co-create action plans and recommendations to various stakeholders so that these visions of sustainable innovation environments of native Andean crops can take into place. The final results will be published in English and in Spanish and will be presented in the Finland Futures Research Centre’s summer conference entitled “Constructing Social Futures – Sustainability, Responsibility and Power” to be held in Turku, Finland on 12–13 June 2019. 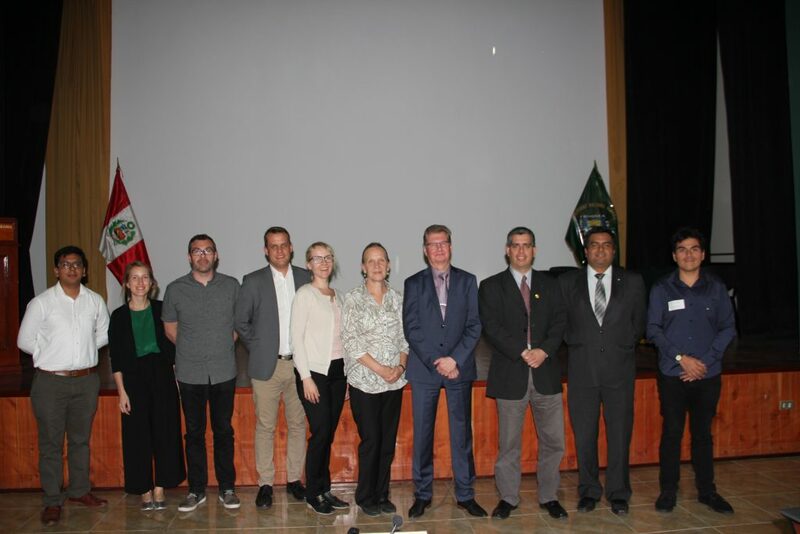 Earlier this month, Hanna Lakkala, Juha Kaskinen and I (Marianna B. Ferreira-Aulu) visited Bogotá and Lima to run the second round of workshops for the project “Native crops for sustainable and innovative food futures in Peru and Colombia – PECOLO” together with local partners. PECOLO project is a collaboration between Universidad el Bosque (UEB) in Bogotá, Universidad Nacional Agraria La Molina (UNALM) in Lima, and the University of Turku (UTU). It is funded by the Ministry for Foreign Affairs of Finland, and has the objective of developing innovation environments around Andean native crops using methodologies and tools of futures studies, as well as to foment high quality research on sustainable and nutritious Andean crops. Figure 1. Process of the PECOLO Project. The second round of workshops was conducted in early May 2018. A 2-day program was ran in both universities: UEB and UNALM. On the first day, FFRC director Juha Kaskinen gave a lecture on scenario thinking for the teaching staff, as well as masters and doctoral students. On the second day, a workshop for non-academic partners was organized, where local experts could exercise scenario building in practice. The experts were invited by our partner universities (UEB and UNALM), and they were coming from governmental institutions, private companies, NGO’s and active members of the civil society. In addition to me, all other facilitators were local, and they participated on the lecture of the first day. Figure 2 . One of the groups discussing in Universidad el Bosque, in Colombia. 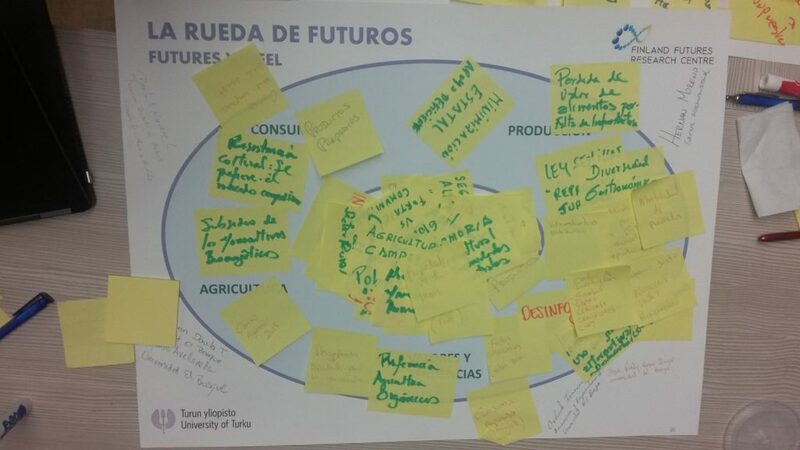 Based on the results from the first workshop conducted in 2017, participants selected (from the futures wheel produced) six important factors for agricultural innovation system considering PESTEC aspects (Politic, Economic, Social, Technologic, Ecologic and Cultural), and constructed a Futures Table. The table consisted on nine lines and five columns. The six important factors picked from the results of the first workshop became variables on the table, and participants filled in four different futures states for each of these variables, using their expert knowledge of the field. Also Megatrends, Black Swans and Weak signals affecting all futures states were stated. Once the table was completed, participants drew paths for desirable, avoidable, and probable scenarios, which were then described as narratives. 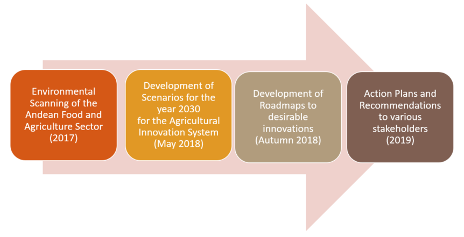 This is the process we used to create the scenarios for the agricultural innovation system in 2030. Figure 3. 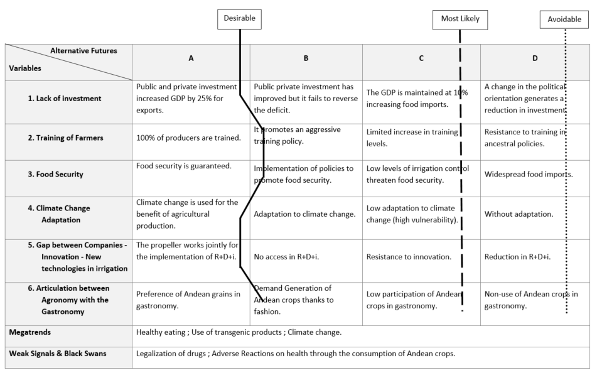 Example of the complete Futures Table of one of the expert groups. Following this work, the next steps are to build roadmaps for these desirable futures (in autumn 2018) and finally, to develop action plans and recommendations to various interest groups (in Spring 2019). Preliminary results from this second workshop shows that experts of both countries, Peru and Colombia, are hungry for more cooperation between sectors of the society. They understand the significance of public-private partnerships and associations, and advocate for transfer of technology (ToT) across different sectors. A common theme in the workshops of both countries was also the improvement of the lives of rural communities and the value of the knowledge of traditional populations for developing innovative systems in the food and agriculture systems. Peruvian and Colombian experts invited to our workshops are tuned in with a growing need to obtain food certifications, as informed consumers in the global market demand information not only on the nutritional value of the foods, but also how products are produced and how workers are being compensated for their work (for example with Organic and Fair Trade certifications). In Colombia, a key driver for a sustainable food system is the formalization of land tenure. Historically, this has been a slow and ineffective process, but improvements on this sector are noticeable since the commencement of the peace process. Futures Tables and Scenarios produced by the Colombian groups show that when formalization of land tenure is done more efficiently and democratically, it triggers several other improvements: a better use of productive land, opportunities for land planning and environmental managements plans, as well as a more rural social development. Formalization of land tenure in Colombia can foment small-scale and organic farming and ensuring a diversity of crops and cultivation methods. In Peru, experts are mainly focused on yet a different aspect: the health benefits of Andean crops. Quinoa, kiwicha and other Andean crops are considered super foods, and all Peruvian groups included the growth of healthy foods in the global market in their Futures Tables and Scenarios. Food security and the elimination of hunger and malnutrition is also an important concern for the Peruvian experts, and several groups advocate for including nutrition and culture of healthy eating in educational programs across the country. Figure 4. Quinoa plantation in Universidad Nacional Agraria La Molina, Peru. We had the opportunity to visit the quinoa and kiwicha plantation of UNALM. There, varieties of these plants are cultivated inside the university campus, and student have easy access to samples and various information of the plants that can be used for their studies and research. Figure 5. 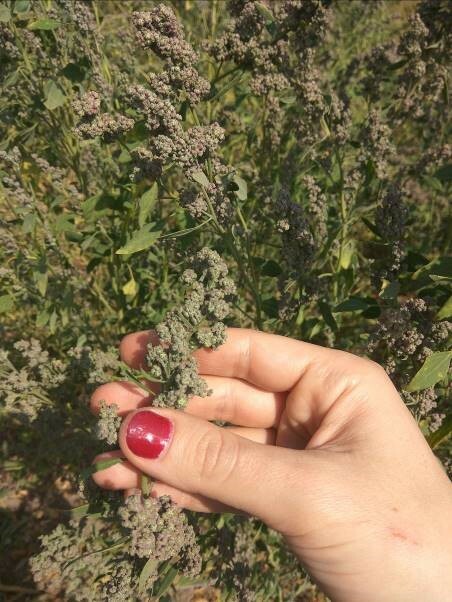 Marianna Ferreira-Aulu holding a branch of the quinoa plant in Universidad Nacional Agraria La Molina, Peru. Quinoa is a gluten-free grain that has been used around the world as a substitute to rice and couscous in various dishes. From a side dish to the main ingredient in a fresh salad, quinoa is growing popularity high nutrient content. The UN named 2013 as the ‘International Quinoa Year’. 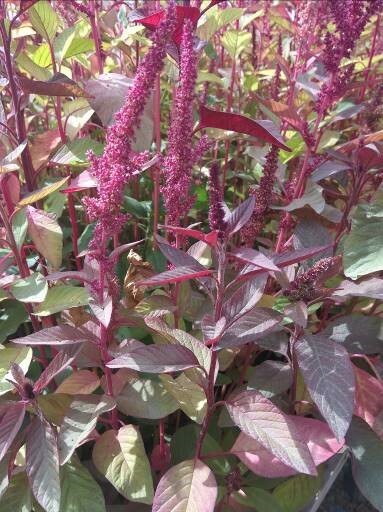 Kiwicha (amaranthus caudatus), also known as amaranth, or amaranto, is a grain that has been cultivated in the Americas for over 7,000 years. 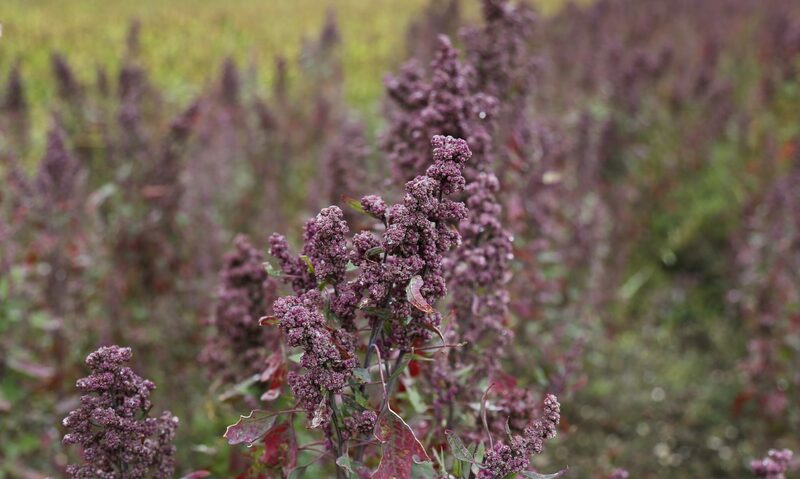 There are over 1,000 varieties of amaranth in the Andes, many of them being studied in UNALM. The kiwicha plants in UNALM are cultivated inside a greenhouse with a doubly-sealed entrance to ensure no pests would enter the greenhouse with us. We also received samples of Tarwi products from one of our workshop attendees. Tarwi is a highly nutritious Andean lupin. As a bean, it is consumed in salads and hot dishes, and as a flour, it is added in desserts, fruit purée, and recovery drink for athletes. Highly versatile, the production of lupin for commercial use is still very small. Could it be that Tarwi is a weak signal soon ready to become a growing trend in the global market? The course “Microorganisms for Functional Foods” was carried out as a part of the PECOLO Project. The course developed for the UNALM (Universidad Nacional Agraria La Molina) was conducted by the international expert Dr. Gabriel Vinderola, of the Institute of Industrial Lactology of the National University of the Litoral in Santa Fe (Argentina). 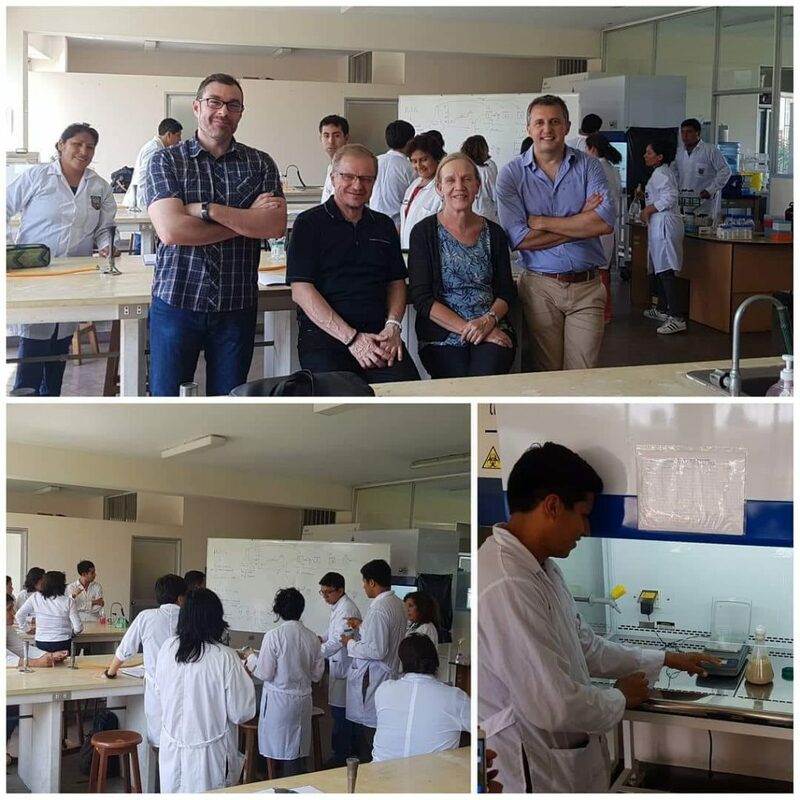 Along with Dr. Vinderola, Dr. Seppo Salminen and Dr. Carlos Gómez Gallego from the University of Turku in Finland participated in teaching activities during the course. Picture 1. Dr. Vinderola and the course participants at microbiology labs in UNALM. The course aimed at PhD students, university staff and industry professionals included topics related to the isolation and characterization of potential probiotic bacteria, biomass production and the incorporation of probiotics in food. Likewise, aspects related to legislation and probiotics, intestinal microbiota and health were addressed during the course. Picture 2. (from left to right) Dr. Gómez Gallego, Dr. Salminen, Dr. Repo-Carrasco Valencia and Dr Vinderola, and the students during the practical work. During the practical sessions led by Dr. Vinderola the students elaborated vegetable drinks and fermented milks with probiotic bacteria facing the technological and microbiological problems that can be found in the elaboration of different types of probiotics. Given the satisfaction of both participants and teachers, we all hope to be able to make new editions of this course in the future. As part of the project, I had the chance to give a four-day course to the doctoral students of UNALM in the beginning of April. My topic was Plant secondary metabolites and health. In addition to the doctoral candidates, the course was open to other students and staff who were interested. I also served as a visiting lecturer of a course related to analytical methods used in food sciences. My course was given in English, partly because of my limited skills in Spanish and partly because the doctoral students are required to have training in English during their studies. After all, Doctoral Programme in Food Sciences requires that the students write a scientific paper in English. This was my fourth trip to Peru and UNALM. At that point of the Spring, the weather in Finland was rather lousy so it was refreshing to travel to the sunshiny Lima. This time I also had the change to travel to Ballestas Islands (“poor man’s Galapagos”) in Ica area to see some penguins, as well as to see and experience the sand dunes of Huacachina. The UEB Staff of the PECOLO Project met for breakfast with key non-academic partners on Tuesday 10th of April 2018 at the VIP restaurant located at the Fundadores building. Kenneth Ochoa V., Colombian coordinator of the Project, presented generalities, key aspects, and the impact of the Project, after all participants introduced themselves and expressed their initial expectations. Next, the participants asked questions about their role in the project, and the UEB Staff answered all their questions, placing emphasis in both the impact of the potential collaboration projects and the benefit of using the Future Studies and Foresight Methodology in the strategic planning processes of their own organizations. At the end of the meeting, participants from: Secretaría Distrital de Ambiente (SDA), Bio Plaza, Instituto Colombiano de Bienestar Familiar (ICBF), Asociación Colombiana de Ciencia y Tecnología de Alimentos (ACTA), and Academia de Innovación para la Sostenibilidad (AISO) expressed their support to the PECOLO Project and their committed participation in the Project workshops. 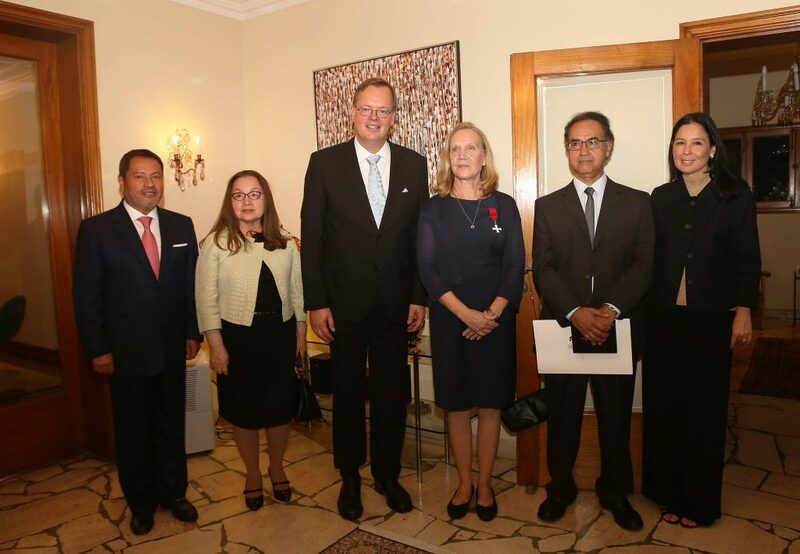 The Coordinator of the PECOLO project at UNALM, Peru, Dr. Ritva Repo-Carrasco received the Order of the Lion on March 19 at the Embassy of Finland for the scientific achievements and contributions to the development of scientific collaboration between Finland and Peru. The Order of the Lion is conferred upon citizens who have distinguished themselves in the service of Finland (although foreign nationals may also be awarded decorations of the Orders). Ritva is a professor in food chemistry at UNALM and an author of a large number of scientific publications focusing especially on quinoa. We are proud to continue the collaboration with her on the Andean native crops and take forward the cooperation between Finland, Peru, and now also with Colombia! Dr. Ritva Repo-Carrasco received the Order of the Lion at the Embassy of Finland in Lima on March 19. Photo credits: Embassy of Finland in Lima. The key for an innovative society and its sustainable growth lies in the investment in Education, Research, and Development. Higher Education Institutions have both human and technical resources to support quality education, R&D, and innovation environments. For this reason, the Project submitted by the Finland Futures Research Center (FFRC) in cooperation with Functional Foods Forum (FFF) of University of Turku, the Peruvian Universidad Agraria La Molina (UALM), and the Colombian Universidad El Bosque (UEB) is looking for sustainable and innovative Andean Native Crops Futures in Peru and Colombia. Director Dr. Juha Kaskinen, Project coordinator Ms. Hanna Lakkala and Junior expert in futures studies Mrs. Noora Vähäkari, from Finland Futures Research Centre at the University of Turku, traveled to Bogotá and Lima for the first set of lectures and workshops of the PECOLO project related to sustainable innovation of local Andean crops. Functional Foods Forum (FFF), Researcher and coordinator Mr. Jaakko Korpela, and post-doc researcher in biochemistry Dr. Carlos Gomez held lectures in their topics and also attended and assisted in the innovation workshops. 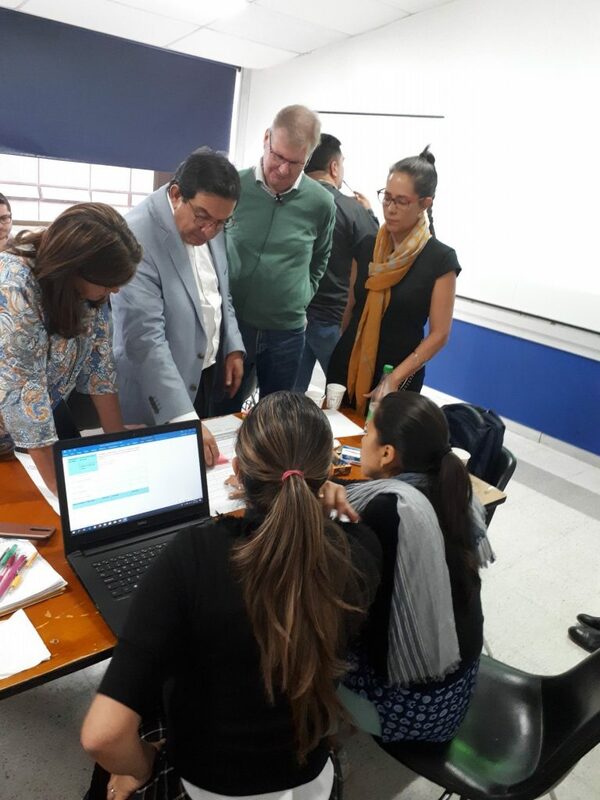 In both locations, Bogotá on November 7th and Lima on November 14th, Dr. Kaskinen started the innovation oriented training session with introduction to futures studies, the history, concepts and key methodology of the discipline. Additionally, he also gave a quick look on the structure and functions of FFRC. In Bogotá, the first lecture gathered some 15 people from various public and private organisations, plus university staff. University of El Bosque, where the training and workshop were held, simultaneously hosted an international conference on medicinal science and technology, which occupied lot of potential audience. In Lima, the two-day training session started off with a warm welcome from the Finnish Ambassador to Peru Mr. Mika Koskinen. In Lima, the participants numbered some 40 people widely across the Peruvian food and agriculture sector and innovation experts. The training session and workshop were organized in the University of Agriculture La Molina campus. 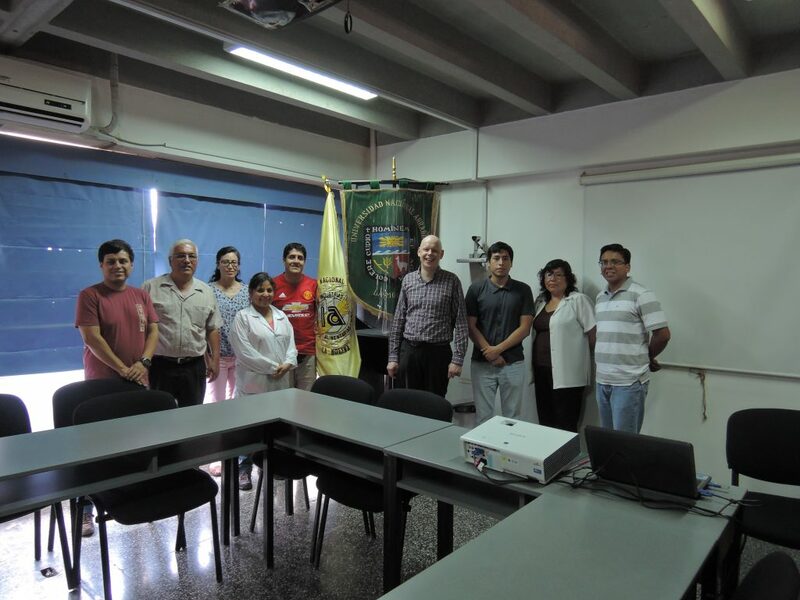 PECOLO project team from Peruvian and Finnish partner universities in UNALM. In the innovation workshops multidisciplinary and participatory simultaneous co-creation and brainstorming methodologies were used. Groups of six to eight people started to discuss about food and agriculture sector in the respective countries, using PESTEC and ACTVOD tables and the Futures wheel canvases. The current or critical or interesting trends and values, innovation systems, production patterns, consumption habits, and important issues related to agriculture were discussed, using the canvases to structure the discussions. The groups discussed topics such as the gap between urban and rural dichotomy, the significance of global trends and market pressure, land ownership and conflicts, environmental issues and access to new technologies and food trends. All ideas were written in post-it pads and attached in large posters. Groups working around the Futures table, PESTEC and ACTVOD tables. The aim of the futures wheel methodology was to spark discussion on the large patterns and changes taking place in the sector and to prepare for the more detailed discussions later on. Once done, all groups chose four to five topics which they wanted to elaborate further in ACTVOD methodology (discussing the actors, customers, transformation processes, values, obstacles and drivers behind the topics chosen). This process not only supported the horizon scanning of the food and agriculture sector in both countries, but also supports the next phases of the innovation path in the PECOLO project. In Bogotá, the work continued the next day with PESTEC analysis (political, economic, social, technological, environmental, cultural aspects and critical signals of the food and agriculture sector), whereas in Peru all three methods had to be done in a single day due to unforeseeable national holiday. PESTEC is a commonly used multidisciplinary tool to elaborate certain topic in various perspectives and to ensure that all critical elements are covered. In this session, the team included also the framework of megatrends, trends, weak signals and wild cards in the work. Consequently, the topical trends and patterns could be assessed in very profound way. The training and workshop sessions in both locations were successful and gathered a lot of interest and positive feedback, particularly on the facilitation of multidisciplinary and cross-sectoral work. They also functioned well as the first steps to open up and continuously work on the sustainable development and use of native Andean crops and built more international discussion space around the future of the food and agriculture sector in both countries. As for the Finnish perspective, the PECOLO project provides a unique academic linkage from Finland to and between Peru and Colombia. Welcome to the page and the blog of the project Native Crops for Innovative and Sustainable Food Futures in Peru and Colombia (PECOLO). The project partners are Universidad Nacional Agraria la Molina (UNALM), Peru, Universidad el Bosque (UEB), Colombia and University of Turku (UTU), Finland. PECOLO is funded by the Ministry for Foreign Affairs of Finland.